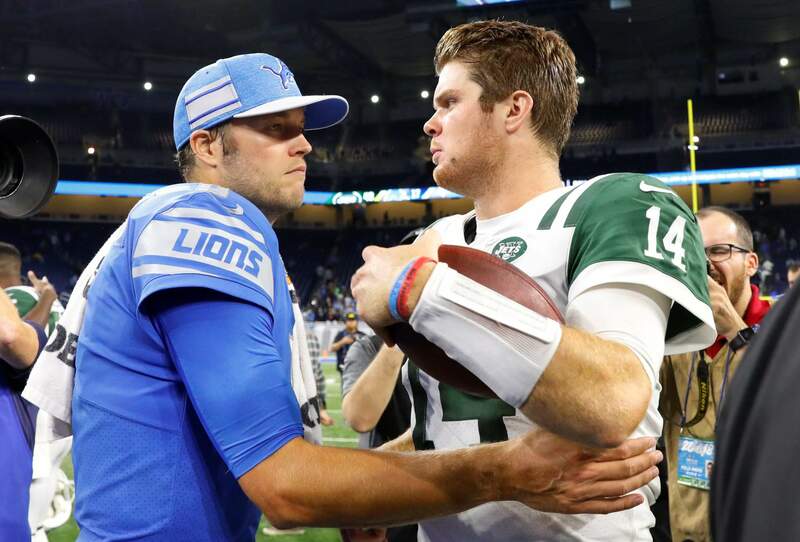 Detroit Lions quarterback Matthew Stafford, left, and New York Jets quarterback Sam Darnold talk after Monday night’s game in Detroit. The Jets won 48-17. DETROIT – Sam Darnold rolled right and made a rookie move, lobbing a football across the field that was picked off and returned for a touchdown. It might’ve been his only mistake all night. The former USC star, drafted No. 3 overall, shook off the nerves and finished 16-of-21 for 198 yards and two touchdowns . Stafford threw four interceptions – one shy of his career high – and left the game briefly in the third quarter after being hit from the front and back by the swarming, hard-hitting Jets. They scored 31 straight in the third quarter to pull away, sending Detroit’s fans for the exits and setting off a jolly green party in the Motor City. It was the highest-scoring third quarter in team history and trailed only the 34-point second quarter the Brett Favre-led team scored in 2008 against Arizona. New York scored on the ground and through the air, on defense and on a punt return by former Lion Andre Roberts. The Jets could’ve piled on even more in the final minutes but turned the ball over on downs after kneeling to take time off the clock. Darnold flipped the ball to a referee after the final kneel down, and the official gave it right back before shaking the rookie’s hand. Darnold was still holding the ball while talking briefly with Stafford on the field. ROADIESLate in the game, just before Cassel threw an interception, hundreds of New York fans chanted: “J-E-T-S, JETS! JETS! JETS!” A crew clad in green and white filed into seats in four sections along the New York sideline and appeared to outnumber Detroit fans who stuck around for the bitter end. “That was awesome to be able to see them doing their thing,” Darnold said. STREAK STOPPEDThe Jets had played an NFL record 73 games, dating to 2013, without a defensive TD before Lee returned one of his two interceptions 36 yards for a score in the third. Trumaine Johnson, Morris Claiborne and Jamal Adams also picked off passes in a strong start for the Jets self-proclaimed “New Jack City” secondary. THREE’S COMPANYDarnold joined Tampa Bay’s Jameis Winston (2015) and Brett Favre (1991) as quarterbacks who had their first pass intercepted and returned for a score. INJURIESJets: CB Johnson (head injury) and CB Buster Skrine (rib) returned to play after leaving the field with injuries. Johnson was evaluated after he intercepted a pass and fumbled after taking a hard hit from Detroit receiver Kenny Golladay. UP NEXTJets: Host the Miami Dolphins on Sunday.